The slasher boom of the early 80s took the world by storm, and it wasn’t long until Hollywood producers realized that if you make one successful film, another one with the same cast or main villain could be just as profitable (and in some cases, even more profitable). Thus, the 80s sequel boom began with films like Halloween II and Friday the 13th Part 2 leading the way. With their own Jaws franchise faring well at the box-office, and Halloween II performing strongly for them as well, Universal Studios looked to the past to see if there was life yet in continuing the story of Norman Bates, Mother, and the Bates Motel. Twenty-three years after the debut of the original film, 1983’s Psycho II was the result. Despite the desperate pleas of Lila Loomis (whose sister was brutally killed in her shower at the Bates Motel all those years ago, a court releases schizophrenic murderer Norman Bates (Anthony Perkins) under the watchful eye of his psychiatrist (Robert Loggia). Norman finds a job at a nearby diner and befriends a young woman (Meg Tilly) having relationship troubles. Having been kicked out of her apartment, Norman invites the girl to stay at the Bates house. However, coming back home brings back many memories for Norman, and it isn’t long before Mother’s presence is felt in the house once again. All the more troubling are the mysterious notes and phone calls Norman begins receiving, allegedly from Mother. Soon, the line between reality and insanity begins to blur, and certain homicidal cravings begin to rear their ugly head once again. The thing I like about Psycho II is that it doesn’t over-concern itself with trying to top the original film, and instead focuses on delivering a solid continuation of that film’s events. Attempting to outdo a Hitchcock film would be a completely foolish task, so it’s refreshing to see the filmmakers here being perfectly content to just do their thing without soiling the sandbox too much. Tom Holland (who later went on to direct such genre favorites as Fright Night and Child's Play)’s script is actually pretty good, although there is one semi-plot twist toward the end that kind of negates a few things from the first one. Though, the twist didn't completely sit well with me, it’s nothing too terribly damaging to the storyline. Though it was released in the prime era of the slasher movie, it doesn’t try to out-do the original film’s body count or get too splashy with the red stuff. While it is more violent than the original, nothing in the movie is what I would consider to be excessive. It plays very much as I imagine Hitch himself would've directed it, with the "less is more" attitude. Coming off solid genre work in Patrick and the very Hitchcockian Road Games director Richard Franklin delivers good work here. Some of the camera angles chosen are loving homages to similar ones that Hitch went with. Though I was skeptical that the Bates home would be as spooky in full color as it was in black and white, Franklin managed to make it so. It's such a shame that his career all but evaporated as the 80s wore on. Anthony Perkins delivers another nicely crazed performance, although none of his lines here give chills like some of his better lines from the original. Vera Miles reprises her role of Lila Loomis and is determined as ever to see Norman spend the rest of his days inside the walls of a mental institution. It’s great seeing her back in action. Instead of Martin Balsam, here we get Robert Loggia. A fair tradeoff, I think. We also get another trademark early 80s sleazeball performance from Dennis Franz (Brian De Palma's Dressed to Kill). Meg Tilly’s performance is quite interesting, as it ranges from wooden at times to completely charming. Whatever happened to her, I wonder? Jerry Goldsmith’s score is often hauntingly beautiful, but it didn’t completely work for me. The original strings score by Bernard Herrmann for the original film is too identifiable with the film and the psyche of Norman Bates, and I think it was a mistake to go in such a radically different musical direction. It's kind of like, if the Jaws sequels had decided not to use Williams' theme, or if a Halloween sequel (or remake) decided not to use Carpenter's original themes. The only time you get to hear any of Herrmann’s frenzied strings work from the original is when Janet Leigh’s death scene is re-played at the main beginning. Goldsmith’s score (a unique combination of synth and strings) isn’t bad by any means, it’s just more deserving of a much different horror film. Audiences of 1960 were horrified at the amount of violence and sexual content that Hitchcock's Psycho contained, although aside from the shower sequence, there was very little of either shown on-screen. The edgy subject matter, paired with Bernard Herrmann’s intense musical score is what likely lead to most believing Hitchcock’s film was more graphic than it actually was. Oh, how times change. Psycho II, on the other hand, features a moderate helping of blood and a scene of Meg Tilly stepping out of the shower that leaves nothing to the imagination. The death scenes aren’t much to write home about, mostly being your usual multiple stabbings with minimal blood. One scene that stood out, however, featured a character having a kitchen knife being forcefully shoved into her mouth with the knife's point coming through the back of her neck. 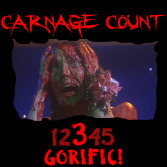 Complete with bloody throat gurgling, the scene is a goriffic standout. Psycho II has been released as both a stand-alone DVD and as part of a 2-disc triple feature set paired with Psycho III and Psycho IV: The Beginning. The picture quality is fine, although there is room for further restoration to be done if the film were to be re-released for Blu-Ray. The only bonus feature included is an early teaser trailer for the film. A special edition would be welcome someday, although director Richard Franklin is unfortunately no longer with us to provide interviews or audio commentary material. Psycho II isn’t a classic by any means, but it’s well worth a watch if you enjoy the original. Though on the surface, it may appear to be nothing more than a desperate attempt by Universal to cash in on an existing franchise in the wake of the slasher film's popularity, director Richard Franklin plays it closer to what Hitchcock would have done than I think most people realize or give him credit for. It's a solid and worthy follow-up to a classic original and it is my recommendation that you Buy it!